Cut nearly $9 million from the budget in the first year and over $3 million in the second year in an effort to dramatically improve the much needed fiscal responsibility for the taxpayers of Bonner County. Created a system for approval of purchases under $5,000 to better track small purchases. Reduced the number of Department heads and made other position manager positions saving approximately $250,000 yearly. Reconfigured the Sheriff’s pay scale to stop the loss of deputies (8 in a year). Retraining costs for new deputy hires runs between $150,000 – $200,000 each. Retention will save up to $1.6 million and help maintain property deputy levels. Put all employees on Merit Pay, pay for performance that includes a bonus incentive. Implemented Self-insurance for Liability, saving over $300K – Created budgetary accountability with department heads for not following proper process. Hired a Procurement/Project manager. Money saved to date from collective purchases, $600K Plus. Money saved on projects due to having our own project manager, priceless. Adopted better policies for handling employee termination to dramatically reduce litigation costs. Pushed a more customer friendly profile for all County employees when dealing with the public. Reduced the fleet and continuing to do so. 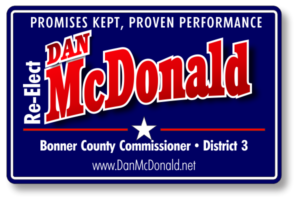 Created a Bonner County Contract for all construction projects that protects the County and the Taxpayers, reducing liability. Streamlined Planning application process for BLP’s as well as eliminating the complicated fee structure for a bracket fee structure. Finished the construction of the new Dufort EMS/Multi Use Facility holding the contractor accountable for substandard work and mistakes. Been the primary on a number of legal cases and mediation from the previous board protecting the County Taxpayers interest. Changed Road and Bridge process back to a focus on maintaining roads over road building. Streamline processes and eliminate redundancy for quicker less costly operation.